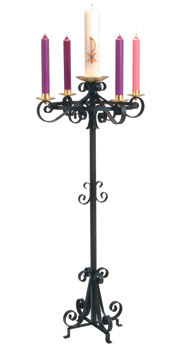 Beautiful Advent Wreath, 48" height to top of ring, 14" Base, 24" diameter overall, 1-1/2" sockets. Centre adaptable to any size candle. Black with brass accents. Also available in a White powdercoat finish upon request.